Trying to manage a massive guest list? Use our filters to make things a little easier for yourself. 1. Head to the Guests tab on your page's editing toolbar. 2. Click on the Filters button to open the filters window. 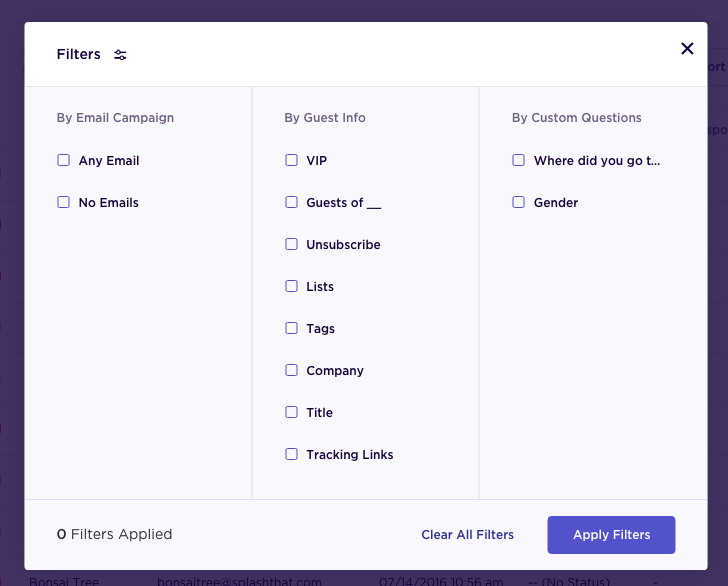 Here, you’ll be able to filter guests by email campaign, guest info, or RSVP form questions. 3. You can edit any filter and select as many or as few filters as you’d like. 4. Once you’ve picked your filters, click the Apply Filters button to see your filtered guest list. How do I add guests to a session?